Around 16% of the UK population is aged over 65, with over 400,000 living in a care environment. The UK’s care estate comprises 5,500 different providers, operating 11,300 sites between them. In England, the Care Quality Commission takes charge of inspecting these sites. Amongst their compliance measures is Regulation 14 of The Health and Social Care Act 2008 (Regulated Activities). This states a registered person must ensure service users are protected from the risks of inadequate nutrition and dehydration. The facility must provide choices of food and drink for people to meet their individual needs, is nutritionally balanced and supports their health and wellbeing. 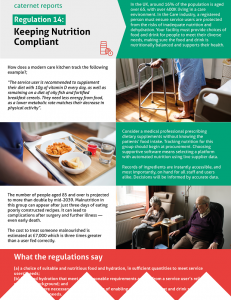 With sharp increases in population, allergies and complex needs, Caternet is well placed to support your care operation and kitchens through Regulation 14. The average cost of self-funded care is now £846 per week. With many service users seeking value, how is it possible to balance healthcare with restaurant quality meals? These expectations place a further squeeze on labour and ingredient costs. Plus, with the average care plan running to 100 printed pages, we show how tracking nutrition can be truly paperless. Download our infographic, check the facts and discover how the procurement, recipes and automated nutrition modules in Caternet software offer an integrated solution to remain compliant and combat malnutrition.